Looking for a short but sweet way of spending a few hours? 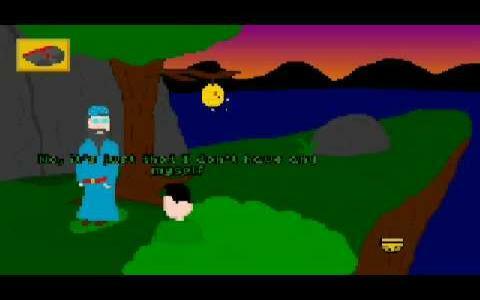 Like point and click adventures in the vein of Monkey Island or Zak McKracken? Then Calsoon could just be your new best friend, if only for a few hours. The game might be a tad on the brief side, but it's got it where it counts, which is in the puzzles and the writing so if you do adventures which don't take themselves too seriously, this is worth a look. The story revolves around a rather strange young man, who unfortunately has a habit of collecting underwear (and no, this isn't a Japanese game but you do have to wonder). However, this has little bearing on the narrative, and this chap soon finds himself whisked off to a bizarre world which happens to be ruled over by an evil witch and who needs taking down a peg or two. This is where the player comes in, and it's your job to help out the inhabitants and generally make the land a nicer place to live. The game plays out in traditional fashion, as you wander the world, collecting items and solving puzzles as you go. There's nothing staggeringly new about Calsoon, in terms of gameplay or visuals and it is clearly the work of an amateur. The graphics have a kind of child-like charm about them and while the script isn't as clever or funny as it would like to think, it too maintains a sort of goofy appeal and which helps to gloss over any shortcomings. Puzzles fare slightly better though and while they're generally fun and entertaining to solve, and which thus helps Calsoon rise slightly above its less than stellar appearance. It's certainly not in the same league as Discworld, but for a bit of homemade fun, you could do worse.